It’s Osama bin Laden’s network of choice. Saudi Arabia has accused it of `serving up poison on a silver platter’. When the Bush Administration failed to shut it down, they decided to blow it up and its correspondents have been killed, locked up in Guantanamo bay, and tortured in Abu Ghraib. This is Al Jazeera, the first Arab TV network in history to reverse the flow of information from East to West, and hailed by turns around the world as the first rumblings of democracy in the Middle East, great entertainment or a serious strategic threat. Free of censorship, this network rose from the ashes of an aborted BBC project to become pivotal in changing the face of the Middle East. From Operation Desert Fox in December 1998, to bin Laden and the chaos of post-war Iraq, Al Jazeera has beaten the major Western networks time and again to the biggest stories. It was the first Arab channel to interview Israelis and the only channel to have interviewed bin Laden face-to-face since 9-11. Such was the thirst for free debate in the Arab world the station never walked or crawled before it ran and it has turned Arabic news on its head. Popularly believed in the West to be pro-Palestinian and a mouthpiece for bin Laden, many Arab believe it to be funded by the Western secret services. Award-winning, taboo-breaking, zeitgeist-making, journalists all over the world have come to trust what they see and hear on Al Jazeera as much as on any Western network. Yet, until now, little has been known about this satellite channel based in the tiny gas-rich Emirate of Qatar. Who started it? Why now? What exactly are its links with bin Laden? Who owns it? 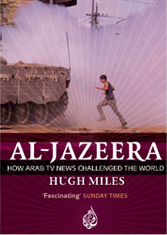 Journalist Hugh Miles, who was born, raised and now revisits the Middle East, was allowed unlimited access to Al Jazeera - `we have nothing to hide’ – and travelled from the Middle East to America’s mid-West to examine its impact and its reputation on the world’s stage. Miles’s’ `biography’ is riveting, and sheds new light on media manipulation and its crucial role in today’s politics and power-broking. So often has Al Jazeera been at the eye of the storm in recent years that its story is also the story of all the upheavals in a troubled region - from the inside. Al Jazeera, he reveals, may have shown the United States how much it is hated in the Arab world, but it has also done more to educate the Arab world about democracy than any other nation – or indeed notion – of the democratic world.